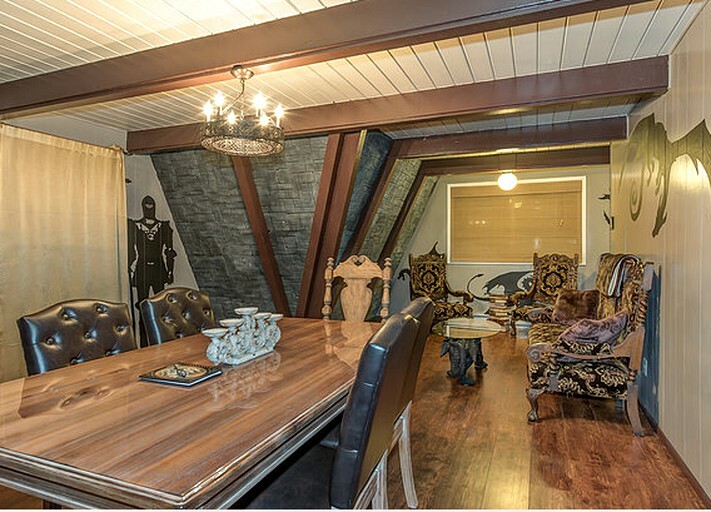 This fabulous A-frame cabin rental is located in a quiet cul-de-sac on Washington State’s stunning Pacific Coast, only 10 minutes from the beach and close to bars and restaurants. 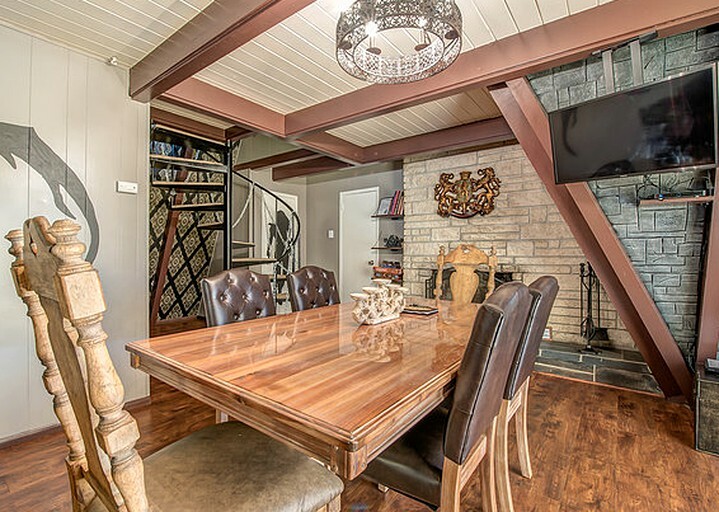 This rental is perfect for adventurous families or couples, accommodating up to five guests. 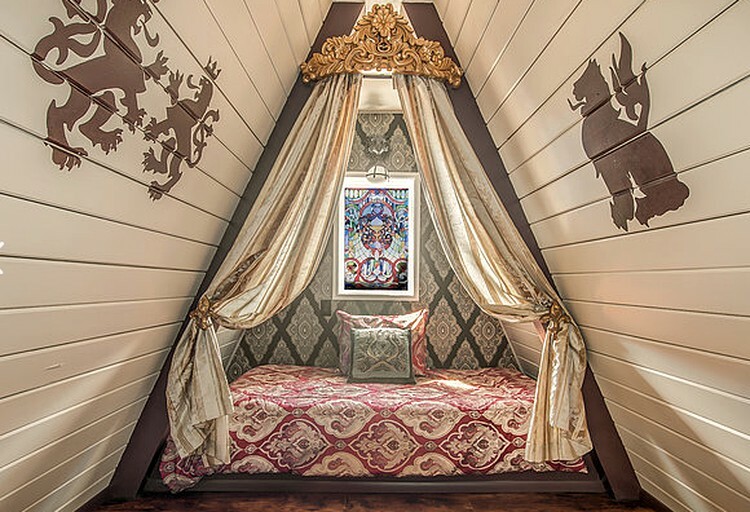 Upon entering the cabin, glampers will be struck by the lavish medieval décor of the rooms and will feel instantly transported to a completely different time and place. The cabin has two queen-size and one twin bed and glampers will truly feel like medieval nobility during their stay here. Towels and bed linens are provided by the host, as well as access to complimentary Wi-Fi and parking facilities. The living and dining area are adjoined, so the cabin really feels open and spacious while maintaining its cozy atmosphere. Guests will enjoy having family banquets on the wooden dining table before collapsing into the luxurious sofas and armchairs to relax in front of the fireplace. 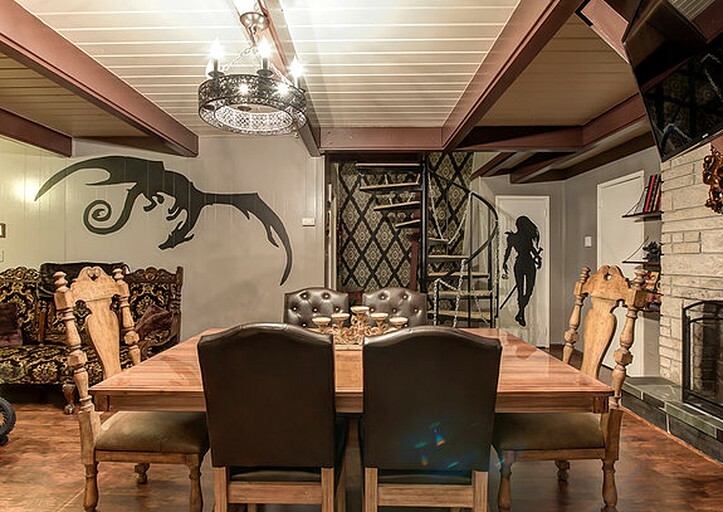 While there is a television to watch films on, there is also a range of board games and books available for guests who would prefer to disconnect a little during their stay at the cabin. 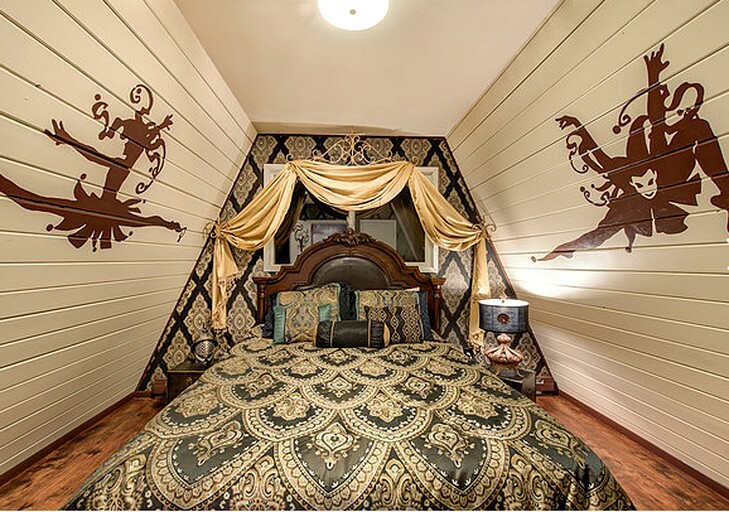 Noble knights and graceful ladies will rejoice in reigning their own castle, slightly haunted, but with a royal touch. This one of a kind experience is only steps away from the beach, Convention Center and all the city's shops and restaurants. This villa is equipped with all essentials you might need: linens, towels, kitchenware, toiletries, etc. It is conveniently located within a walking distance to all city amenities but is surrounded by greenery for a peaceful street noise-free escape. 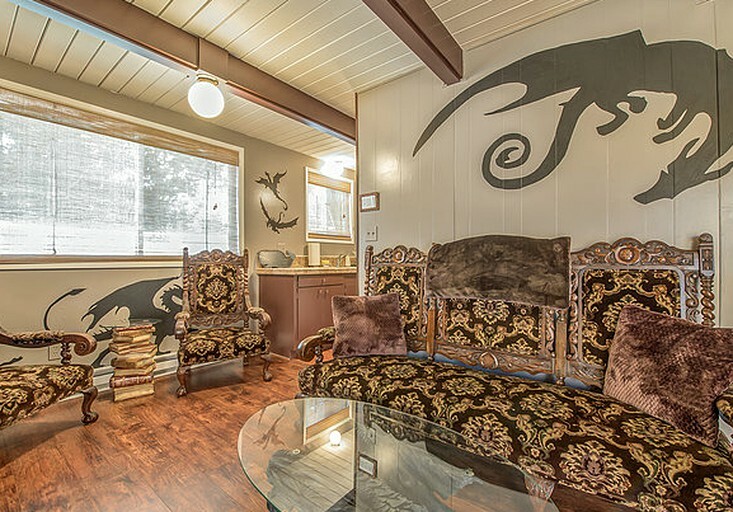 The unique decor is fun for kids and adventure seekers. Netflix, Direct TV, Wi-Fi, and books and games for a rainy day are provided by the host. Guest have access to a beautiful courtyard with a bench, where guests can have a barbecue. There is a laundry facility on site and off-street free parking for up to two cars. 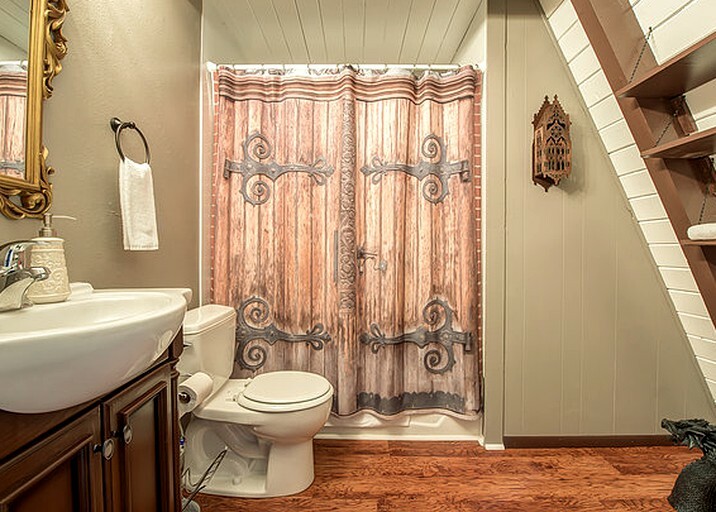 There is one full bathroom with bathtub, a handheld showerhead, and a water efficient toilet. Clean towels and linens are provided. Soap, shower gel, shampoo, and conditioner are provided. There are two bedrooms with queen-size beds, and this villa sleeps up to five guests. The bonus room has an extra-large twin alcove bed This room does not have a private door. This unit has two regular sized bedrooms and one bonus room (the bonus room doesn't have a door) is adjacent to the upstairs hallway, but it has a twin-size sleeping space and good size closet. This bonus room could be a great kids room or playroom. The bathroom, kitchen and living room are located on the ground floor, whereas the bedrooms are on the second floor and are accessible via a spiral staircase. 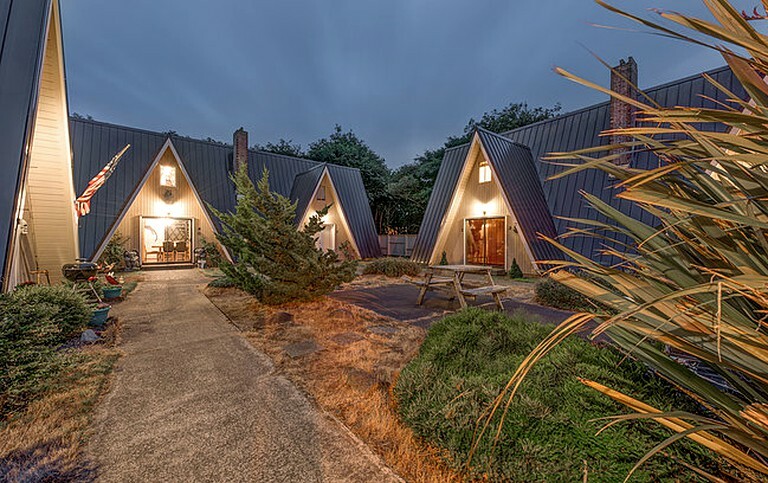 This unique property is located in the charming beach town community of Ocean Shores, Washington. The property is situated right at the heart of the town, close to all the surrounding restaurants and bars while only a 15-minute walk from the expansive beaches that have made this region famous. Less than an hour by car, the magnificent Olympic National Park is definitely a must-see for glampers who are staying at the property. With huge natural diversity, there is something for everyone in this impressive National Park, spanning almost one million acres of land. There is endless enjoyment to be had on the idyllic surrounding beaches that are ideal for family gatherings including roasting s'mores around firepits, flying kites, riding horses, and simply enjoying the sunshine and the feel of the shore lapping onto one’s toes. Glampers may even explore the length of the coast and its scenic beaches by car on days when the weather is a little less forgiving. The nearby Olympic National Park has a number of must-see attractions that will excite any glamper with a love of the great outdoors. Glampers will be able to see the remarkable biodiversity of the National Park exploring Hurricane Ridge Trail and they will undoubtedly be awestruck by the magical Sol Duc Hot Springs and Fall. Glampers will also enjoy the nearby sites of cultural significance, such as Kurt Cobain’s House and Memorial Site in Aberdeen, and the town of Forks, as mentioned in the internationally celebrated 'Twilight Saga'. Check-In Time is 03:00 PM. | Check-Out Time is 11:00 AM. Late check-outs will incur a $75 fee and are subject to availability. This is a non-smoking property. Smoking is NOT allowed on the premises. Failure to comply with this rule may result in a $250 penalty. Pets are allowed in pirate and Hawaiian villas only. Pets are not allowed in medieval and Egyptian villas. An extra person fee applies plus a tax per person/day for groups larger than two people. Failure to disclose the correct number of guests or pets may result in a penalty of double the normal rate. Guests will be charged a cleaning fee, and a refundable security deposit of $250 is required one to two days before check-in. The security deposit will be refunded within 5 days after check out if there is no damage or missing items found. 100% will be refunded if canceled more than 60 days prior to the Check-in Date. 50% will be refunded if canceled more than 30 days prior to the Check-in Date.